For a growing number of us, it's no longer enough to buy a shiny and new readymade piece of furniture. 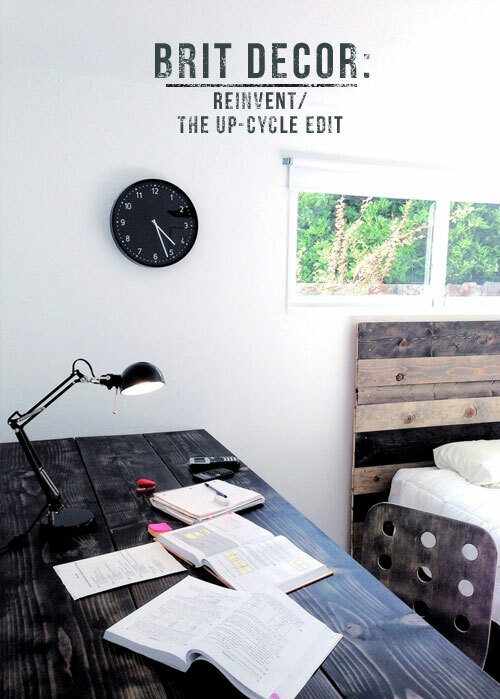 Up-cycling is a new type of ownership, one that allows individuals to create their very own creative accessories and furnishings, and to truly own the creative process and the final, unique result. 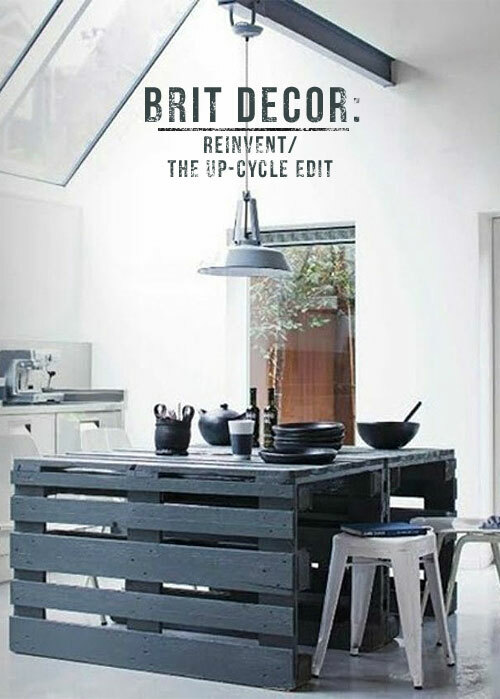 If like me, you are 'time poor' but rich in creative ideas, we shouldn't shy away from the thought of up-cycling projects. Even for larger scale furniture items, sometimes all that is needed is a creative eye and spatial awareness to create a high-impact piece in next to no time at all. 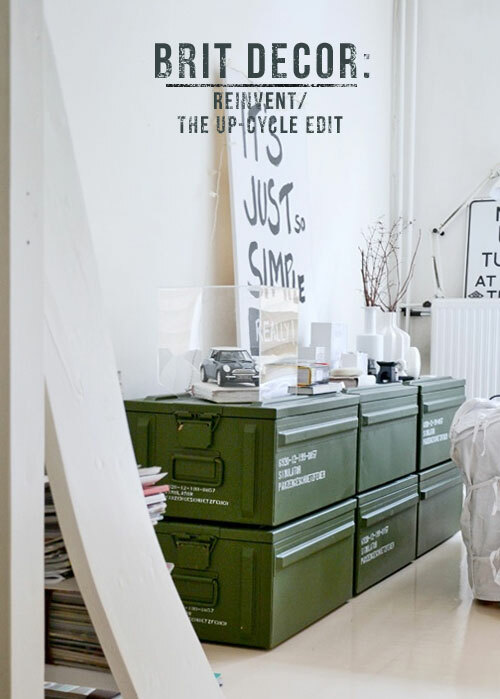 Take for example the army regulation metal crates (image 5 directly above), where simply stacking the boxes to form an industrial-style sideboard, brings a graphic punch to this living space - I love the detail created by the white stencilled graphics, and these boxes offer a great storage facility too. The owners of the bathroom in the first image (above) really have mastered the art of up-cycling. 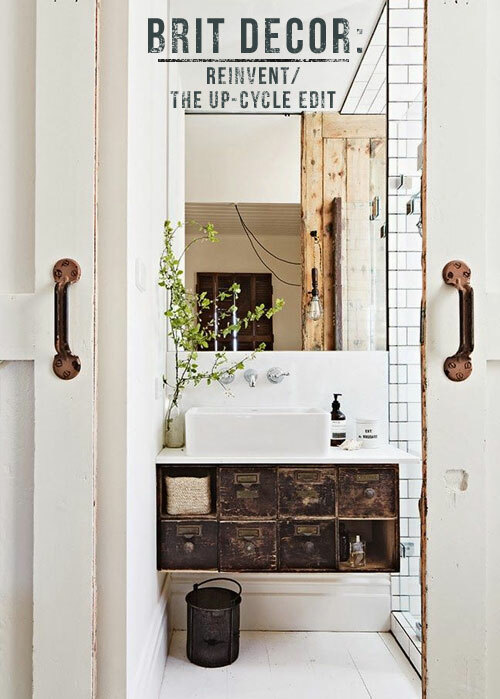 Here they have applied some savvy sourcing skills to create this incredible vintage-look bathroom. Scouring auctions and vintage stores is a great way to pick up some ex-industrial pieces like the compact drawer unit installed underneath the sink, or the vintage metal bucket - now used as a design detail waste bin. The sliding doors are also re-claimed and bring a wall of texture to the space, and did you notice the vintage milk bottle, now serving as a simple but elegant vase? For those of us with a little more time to spare or a readily available carpenter to hand, the striking minimalist worktop in image 2 brings an up-cycled look to this monochrome kitchen. Palettes are relatively inexpensive and easily sourced - you may even get these for free from a local warehouse if you ask nicely! Here, painting the wood black has sharpened the overall look and created a dramatic centre piece. Image 3 offers another easy style solution with this recycled door, which has been sanded down to create a beautiful dining table. Doors actually provide a good solid base for a table top and bring plenty of character to the table - a great conversation piece for dinner parties. Trestles or metal frames are easily available from IKEA and other stores, and these bring a contrasting 'edge' to the final piece. To really accentuate this look, incorporate mis-matched dining chairs or a reclaimed bench for added variety and interest. 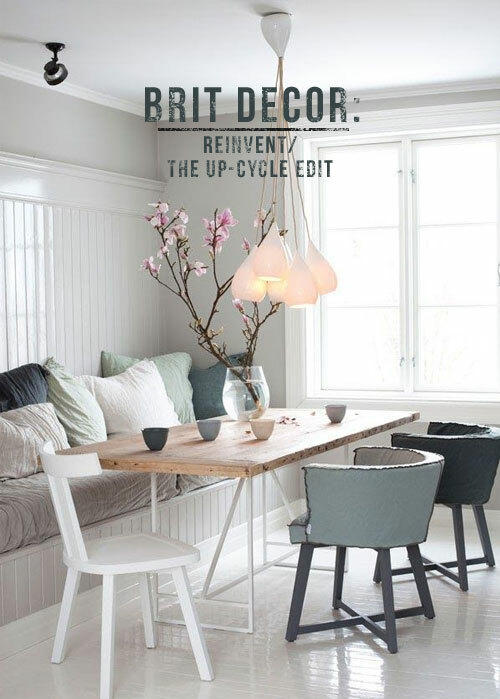 The Nordic-style bedroom setting in image 4 goes all out on the up-cycling front. Using reclaimed wooden palettes to construct this stunningly textured headboard brings instant warmth to the space. Dressed with simple white cotton bedding, the contrast between softness and texture is at its most powerful. I love how these home owners have also incorporated recycled wood into the custom-made desk which is rich in texture and detail. Brit Decor: Christmas with Zazzle.co.uk!